May 20, 2018 - Hartland — On Tuesday, students and staff at the Hartland Elementary School will celebrate the installation of a solar panel and solar tracker that students won following their participation in a statewide challenge that encourages alternative ways to get to school with the goal of reducing carbon emissions. May 17, 2018 - AllEarth Renewables wishes to congratulate all of the participants in the recent Vermont Science, Technology, Engineering and Mathematics Fair, and to announce the winners of the event’s AllEarth Renewables special awards. September 19, 2017 - The dominance of single-axis trackers in the large utility-scale solar market sometimes steals the limelight from its dual-axis cousins. But dual-axis trackers—those that follow the sun more directly than single-axis models’ east-west path—have their place in residential and commercial markets. We caught up with Vermont’s AllEarth Renewables to learn more about dual-axis solar trackers and what makes them a great choice. August 23, 2016 - Three state-of-the-art, American-made solar trackers are now powering the Grenada Elementary School in Grenada, California. July 8, 2016 - Another landmark Northeast Kingdom Vermont business is going solar with AllEarth Renewables. June 10, 2016 (PDF) - AllEarth CSO Andrew Savage discusses the solar industry's recent milestone of a million solar systems installed nationwide. June 2016 (PDF) - Vermont Technical College has flipped the switch on a new solar farm that is projected to produce nearly 1 million kWh of clean, Vermont renewable energy each year. June 13, 2016 - Twenty-two innovative solar trackers are now powering metalwork company Sungen Circle Finishing in Newburyport, MA. May 2016 - Find out what we've been up to! May 18, 2016 - Vermont Technical College has flipped the switch on a new solar farm that is projected to produce nearly 1 million kWh of clean, Vermont renewable energy each year. April 2016 - Find out what we've been up to! April 28, 2015 - AllEarth Renewables has become the newest member of the nation’s largest state solar power trade association, the California Solar Energy Industries Association (CALSEIA). April 26, 2016 - AllEarth Renewables has announced they will donate a portion of every tracker sale in North Carolina to the repeal effort of HB 2, the state's new discriminatory law. March 30, 2016 - Vermont Smoke & Cure, maker of delicious smoked meats and meat snacks since 1962, is teaming up again with AllEarth Renewables of Williston, Vt. to source local renewable solar to power the company’s electrical needs. March 2016 - Find out what we've been up to! March/April 2016 (PDF) - The value of residential solar trackers for installers and customers. March 28, 2016 (PDF) - AllEarth Renewables is becoming a go-to solar firm for breweries in the Northeast, with installations at Woodchuck Cider, Maine Beer Company and The Alchemist. March 29, 2016 (PDF) - The biggest boom and bust story of 2016 won’t happen, thanks to the extension of the solar federal investment tax credit. And if there is one sector in solar counting its lucky bearings and torque motors, it’s that of the tracker companies. March 14, 2016 (PDF) - The owner and orchadist of AllEarth Solar customer Champlain Orchards in Shoreham, VT, speaks to the importance of solar to the local food movement. The Brewer Magazine - When Sustainability is a "No Brainer"
January 19, 2016 (PDF) - AllEarth Solar customer The Alchemist (maker of Heady Topper) is featured in this article on why breweries should go solar. January 12, 2016 (PDF) AllEarth Renewables was included on the list of the top 28 Best Places to Work in Vermont 2016. January 13, 2016 (PDF) - AllEarth Renewables has announced the introduction of a new L20 solar tracker designed for 72-cell PV modules with a landscape orientation option. January/February, 2016 (PDF) - AllEarth Solar Trackers are helping to power Maine Beer Company's brewing facilities. January 5, 2016 - An innovative Vermont-made solar tracker is now helping to power the Middle School of the Kennebunks in southern Maine. December 19, 2015 (PDF) - Vermont Technical College is going solar in hopes of creating a great learning opportunity in addition to saving money through renewable energy. November 16, 2015 - AllEarth Renewables, the award winning Vermont-based solar tracker manufacturer, has announced the hiring of Debra Royce as its Chief Financial Officer. November 10, 2015 (PDF) - The Alchemist, the Vermont maker of Heady Topper, is getting a boost from the sun to green its brewing operations. November 4, 2015 - The Alchemist, the Vermont maker of Heady Topper, is getting a boost from the local sun to green its brewing operations. October 19, 2015 - A new solar farm powering a retirement community is helping fund the gift for a Make-A-Wish child in Vermont. September 30, 2015 - In this op-ed, AllEarth CEO David Blittersdorf talks about renewables, the dangers of carbon dependence, and the importance of "building a future Vermont as bright as our past." September 12, 2015 (PDF) - President Obama is setting the US on a course toward producing much cleaner energy. Vermont offers a glimpse of that vision - and what the state needed to do to bring it about. September 1, 2015 - A new partnership will bring the innovative AllEarth Solar Tracker solar electric system to homeowners and businesses in Washington State. August 10, 2015 - Three innovative solar trackers are now powering the home of Bob and Amanda Montgomery in Sullivan, Illinois. August 18, 2015 - A new partnership will bring the innovative AllEarth Solar Tracker solar electric system to homeowners and businesses throughout North Carolina. July 21, 2015 - A new solar farm is powering the state’s correctional facility in St. Albans and has helped fund the wish for a local Make-A-Wish child. July 20, 2015 (PDF) - Solar PV racking manufacturers, including AllEarth Renewables, explain the design considerations needed in order to keep solar arrays from getting blown away. July 15, 2015 - The beer at one of Maine’ s top breweries just got a little sweeter thanks to two innovative solar trackers now powering the brewery and tasting room for The Maine Beer Company, in Freeport, Maine. June 30, 2015 - A new partnership will bring the innovative Vermont-made AllEarth Solar Tracker solar electric system to homeowners and businesses throughout New Hampshire. June 24, 2015 - AllEarth Renewables, the award-winning dual-axis solar tracker manufacturer, has announced a rebranding to position the company for its national expansion with a growing group of solar developer and installer-partners around the country. May/June 2015 (PDF) - With technology costs down, financing improvements up and a solar system turned on every 2.5 minutes in America, the standardization of solar permitting is poised to be one of the solar industry's next big breaks. May 19, 2015 - AllEarth Renewables has announced a new dealer training program designed to support its growing network of solar tracker installers across the country. May 2015 (PDF) - An AllEarth Solar Tracker home installation was featured in the "Ingenuity in Renewable Energy" section of the May/June 2015 issue of Home Power Magazine. SEIA - Is Standardized Solar Permitting Next Industry Breakthrough? April 20, 2015 (PDF) - With technology costs down, financing improvements up, and a solar system turned on every 2.5 minutes in America, standardizing solar permitting is poised to be one of the solar industry’s next big breaks. April 2, 2015 - Innovative American-made solar trackers are now helping to power federally operated tribal hospitals in southwestern South Dakota. March 23, 2015 - AllEarth Renewables has announced the hiring of Phil Pouech as its director of operations. January 27, 2015 - The 500kW solar installation of AllSun Trackers on land owned by the Livingston family in Bristol, Vt. provides emissions free solar energy for Wake Robin’s retirement living facility in Shelburne, Vt.
February, 2015 (PDF) - When the North Bay's largest recycler of rubble materials saw their electric bills double overnight due to a rate redesign, the looked to solar to help. January 19, 2015 - SolarSense, a provider of clean, reliable and affordable power for commercial and industrial scale customers in the U.S., announced the commissioning and financing of 2.15 megawatts (MW) of net metering projects utilizing American-made AllEarth Solar Trackers. January 7, 2015 - A new partnership will bring an innovative, award-winning solar energy system to homeowners in the greater Hartford area consisting of the towns of Windsor, Windsor Locks, East Granby, and Suffield. October 30, 2014 (JPG) - Partnering with ReVision Energy, Maine Audubon will be installing the largest array of solar panels installed by any conservation organization in the state, using AllSun Trackers. October 29, 2014 - The 144kW solar installation of AllSun Trackers at Pulling Farm in Addison, Vt. provides emissions free solar energy for Danforth Pewter and Gardener’s Supply Company, two iconic national companies based in Vermont. October 13, 2014 - Solar power is the primary energy source for a California quarry caught between a rock and a hard place over changing electric rates. October 8, 2014 - AllEarth Renewables and Claire Solar Partners have announced the completion of a 2.2MW solar tracker farm in South Burlington, Vt.
October 7, 2014 (PDF) - Six AllSun Trackers were recently installed in Burrillville, Rhode Island by our dealer partner E2SOL. September 29, 2014 (PDF) - AllEarth Renewables and Claire Solar Partners announced the completion of a 2.2 MW solar photovoltaic (PV) tracker farm in South Burlington, Vermont. September 19, 2014 (PDF) - A 30-AllSun Tracker project to power Loring Air Force Base in Limestone, Maine. Installed by Maine Energy Performance Solutions out of Washington, Maine. September 4, 2014 - AllEarth Renewables today announced that it has initiated construction on nearly 5 megawatts of projects utilizing its dual-axis solar tracker systems to provide power to 12 state government facilities in Vermont. September 1, 2014 (PDF) - AllEarth CEO David Blittersdorf is featured on the cover of the September 2014 edition of Vermont Business Magazine. June 16, 2014 (PNG) - Morse Farm Maple Sugarworks in East Montpelier, Vermont, installs a 30kW solar tracking system for its maple syrup operation. April 16, 2014 - AllEarth Renewables, a Vermont-based solar tracker manufacturer and SunPower commercial dealer, has received the SunPower “Commercial Regional Top Producer of the Year” award for its sales performance in 2014. March 4, 2014 (PDF) - A New England ski operation -- the Berkshire East Ski Resort -- has fully embraced green energy, installing both wind and solar power over the last several years, and is now the first ski resort in the world to be completely powered by on-site renewables. February 26, 2014 - Through local solar installer North Coast Solar, the Soiland Company recently commissioned a 202 kW, 33 dual axis solar tracker installation in Cotati, California. January 1, 2014 (PDF) - Our dual-axis AllSun Tracker has been selected for a 200kW net metered project in the northern California town of Cotati. December 20, 2013 (PDF) - AllSun Tracker pallet system featured. November 25, 2013 - The AllSun Tracker has been selected for the Claire Solar Partners project, a 2.2MW solar farm to be constructed under Vermont’s Sustainably Priced Energy Enterprise Development (SPEED) standard-offer program. September 11, 2013 - Gov. Peter Shumlin and Vermont renewable energy businesses today announced an initiative to provide solar power to 10 state facilities located throughout Vermont. 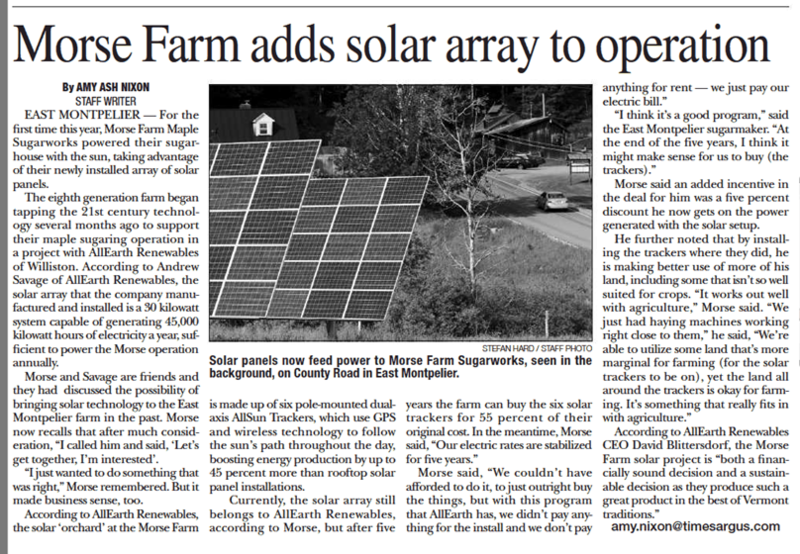 May 1, 2013 (PDF) - AllSun Trackers featured in article on how farmers can improve their viability by using solar PV systems. April 18, 2013 (PDF) - Woodchuck Hard Cider blogs about its new 26-tracker solar orchard, which helps to power its facility in Middlebury, Vermont. April 1, 2013 (PDF) - AllEarth Renewables ranked #3 Best Place to Work in Vermont in 2013. December 25, 2012 (PDF) - Sara Widness writes about AllEarth Renewables entering new partnerships across Vermont and eyeing U.S. expansion. October 1, 2012 (PDF) - AllSun Tracker highlighted as a featured product. October 1, 2012 (PDF) - AllSun Tracker case study with installer partner Rich Nichol. September 1, 2012 (PDF) - AllEarth Renewables named one of the top ten fastest growing energy companies in the U.S.
July 13, 2012 (PDF) - As the volatility of the 2011-12 season made clear, the stake ski resorts have in resolving climate change is a big one. July 9, 2012 (PDF) - The South Burlington Solar Farm is unique in that it utilizes a decentralized design with 382 SMA string inverters integrated with dedicated AllEarth Renewables AllSun dual-axis trackers. June 6, 2012 (PDF) - AllEarth's REWIRE program featured. June 1, 2012 (PDF) - AllSun Tracker highlighted as a featured product. June 1, 2012 (PDF) - For a segment of the solar photovoltaic systems market whose future is constantly being called into question, the tracker segment remains highly resilient. 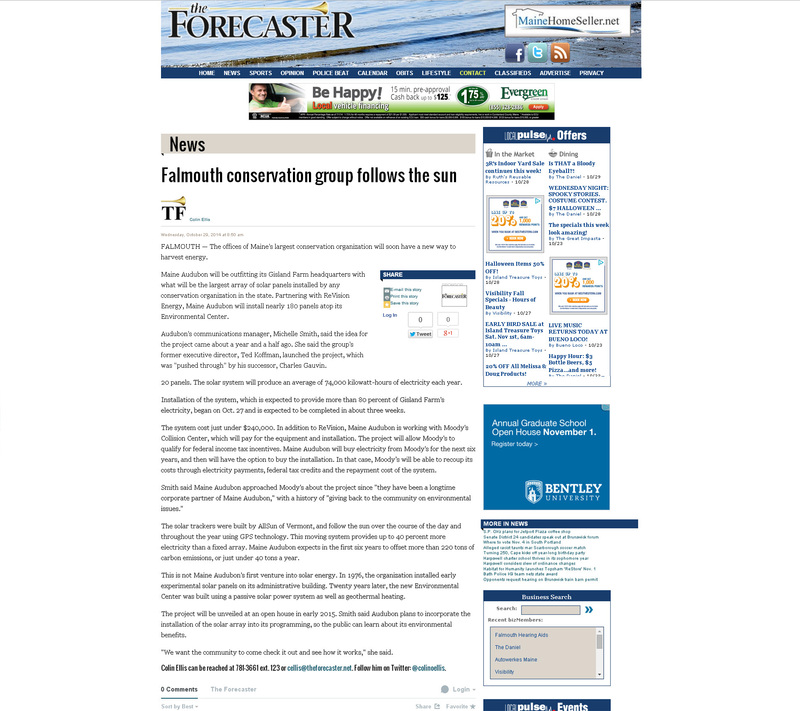 April 1, 2012 (PDF) - AllSun Tracker highlighted as a featured product. March 5, 2012 (PDF) - Article by AER's Andrew Savage outlines Vermont's model for streamlining expansion of small solar installations. June 27, 2011 (PDF) - AllEarth Renewables has designed and installed the largest distributed solar tracker farm in North America.